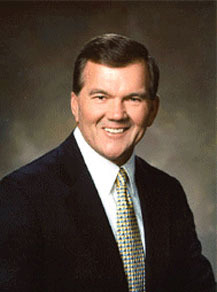 Tom Ridge was the first Secretary of the United States Department of Homeland Security (DHS), and a former Congressman and Governor of Pennsylvania. He resigned in November 2004, and was replaced by Michael Chertoff. His father was a working-class Democrat, his mother a Republican. He was born in Pittsburgh and grew up in a public housing facility in Erie, Pennsylvania. He got a scholarship to Harvard, but his education was interrupted when he was drafted into the Army. He is one of the few high-level Bush administration officials who served in Vietnam, rising to staff sergeant and earning a Bronze Star for Valor. His tour of duty was curtailed when his appendix ruptured. After his military stint, Ridge earned his law degree, worked as a lawyer, and became Assistant District Attorney in Erie County. He was elected to Congress in 1982, where he sat until 1995, when he was elected Governor of Pennsylvania. As a Republican Governor, he was somewhat moderate, and embraced a limited form of abortion rights. He also called a special legislative session that led to a "three-strikes law" and a speedier death penalty. In the aftermath of September 11, President George W. Bush named Ridge to oversee an Office of Homeland Security, with instant access to information on terrorist threats from the CIA and FBI. It quickly transformed into a new bureaucracy, the U.S. Department of Homeland Security, cobbled together out of parts from several other federal agencies, including the Coast Guard, Customs, the Immigration and Naturalization Service as well as the new Transportation Security Administration. Since taking charge of Homeland Security, Ridge has primarily been visible to most Americans at press conferences where he announces that vague "chatter" and "intelligence" indicates a "threat" to an upcoming sporting or political event. One of Ridge's first acts was to institute the fatuous color-coded "Homeland Security Advisory System". In another memorable press conference, Ridge suggested that Americans should buy duct tape and plastic sheeting to seal homes and offices in the event of a chemical attack. He has authorized using demographic and marketing data to establish whether individual U.S. air passengers are "rooted in the community", and flagging suspect passengers for further review. Beginning in January 2004, all visitors to the U.S. from nations deemed as terrorist-friendly (about 27 million people annually) have been required to have their fingerprints and photographs taken for DHS files. Under DHS guidelines, credentialed journalists from friendly nations are now required to show a special "press visa." In several instances, reporters with otherwise valid visas have been detained at U.S. airports or even deported. Ridge has proposed that the government should reconsider more than a century of tradition and law and give the military authority to act as police, making arrests and if necessary firing their weapons on U.S. soil, in the event of a terrorist attack. In the spring of 2002, Congress asked Ridge to formally answer questions regarding the Department of Homeland Security's efforts to combat terrorism. He refused, under instructions from Bush, who explained, "I have an obligation to make sure that the presidency remains robust, and that the legislative branch doesn't end up running the executive branch." Since leaving office he has made headlines by urging that the U.S. Constitution should be disregarded when dealing with accused terrorists. Ridge wears a hearing aid in his left ear, a vestige of a childhood ear infection.